I have to admit I am a bit of a tanning freak in that Summer and Winter I do like to have a little bit of colour, I just think it makes the skin look healthier and clothes just that little bit nicer, also, and this is a big plus for me, I think it makes you look slimmer. 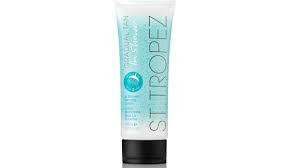 I have recently discovered the EASIEST way of fake tanning EVER, St Tropez gradual tan in shower , it literally takes 3 minutes to apply, very similar to in shower moisturisers, simply shower, rinse, turn the shower off, apply tan on wet skin which makes it really easy to apply, make sure to wash tan of palms, wait 3 minutes and rinse off, the lotion leaves you beautifully moisturised and the tan gradually builds as you go about your daily business, it can be used daily or whenever you feel like a little boost. This is currently on offer at Boots Click here and is £9.67 instead of £14.50, Boots currently have 1/3rd off all San Tropez products.